Arrested in Fort Myers? Contact a Lawyer at Our Firm! Florida Defense Attorney Darren Finebloom with CNN’s Lisa Bloom. Finebloom & Haenel, P.A. is a criminal defense law firm dedicated to representing defendants facing all types of criminal charges throughout Fort Myers and the surrounding areas in Lee County, Florida. As skilled criminal defense lawyers, we understand exactly what must go into building a successful defense strategy in order to effectively challenge your charges and protect your rights. We know that being arrested is an embarrassing and frightening experience. You may be left wondering what you can do to have any chance of avoiding criminal charges and a conviction. Consulting a criminal defense attorney is the first step you should take, as an attorney can inform you of your legal rights and help you understand your options at this point. You can then make an educated decision regarding your legal representation and your future. It is important that you do not wait to consult a criminal defense attorney. If you or someone you know has been arrested or is facing a criminal investigation in Lee County, Florida, an attorney at our firm can help you. We offer a free initial case evaluation to get the process started and can answer your questions and address your concerns about your particular case. With our experience in this field and our dedication to achieving excellent results, you will have the strong legal presence you need both inside and outside of the courtroom. When you work with a lawyer at Finebloom & Haenel, you can feel assured that your case is in good hands. We will work to provide you with aggressive legal representation and personalized attention throughout the life of your case. 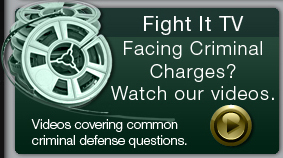 Facing criminal charges in Fort Myers, Florida? Contact a criminal defense lawyer at our firm today!